Vous recherchez une expérience authentique Hawaï? Ma maison est une chambre maison de cèdre personnalisé sur une ferme de 5 acres à North Kohala sur la grande île d'Hawaï. La propriété est privée et paisible, mais est seulement un mile en ville. La maison est alimentée par le soleil et la sérénade par le bruit apaisant du vent dans les palmiers. Quand la lune est sorti, la danse de la lune dans les paumes est magique. Arbres fruitiers mangue, litchi, jaboticaba, avocat, carambole, la crème de pomme et de plus-Grâce la propriété. Cuisine et beaucoup d'espace de comptoir entièrement équipée. Visitez le Farmers Market sous les banians le samedi matin et apporter des fruits et légumes locaux de retour pour préparer votre ferme repas frais. Vous ne voulez pas cuisiner? Profitez de l'un de nos cafés ou restaurants locaux à environ un mile sur la route. La maison a une magnifique douche extérieure et baignoire, ainsi que d'une douche intérieure et salle de bains. Californie lit king size confortable avec une verrière magique de lumières. Il ya beaucoup de la hausse des sentiers battus dans le Nord Kohala et vous pouvez nager au large Mahukona jetée dix minutes sur la route. Plus belles plages de l'île sont une demi-heure de route, tout comme les stations balnéaires et les restaurants de classe mondiale. La propriété est à la maison à un taro hawaïenne indigène qui pousse projet est une vraie ferme de travailler avec le taro, les porcs et les poulets. Si vous êtes un écrivain, lecteur, artiste, profiter de la méditation ou tout simplement apprécier d'être dans un cadre naturel, vous trouverez le calme et l'intimité de ma maison pour être un havre de paix. Cela ne veut pas votre location de vacances typique, mais est ma merveilleuse maison une vraie maison loin de la maison. Il ya une seule chambre à coucher, il est donc mieux adapté à un couple, mais les jeunes enfants peuvent être logés en mettant en place un lit futon dans le salon. Il ya aussi une petite cabane et tental (cabine de tente) avec une salle de bains et cuisine sur la propriété. Ceci est également disponible à la location si vous avez membres de la famille, les adolescents, ou cherchez un hébergement pas cher. Demander au propriétaire. Amazing off grid living. If you love quiet, listening to your own music, watching lizards catch bugs and listening to the birds and roosters wake you in the morning, then this is your Hale. A great respite from the tourist areas of the big island, but close enough to good eating should you want that. We made our own meals most of the time. Mahalo!! This was our 2nd time staying here for a month over the Christmas-New years season. It was like returning home! We love Hawi and this home! The temperature in the Hawi area is a little cooler than to the south, but very pleasant. 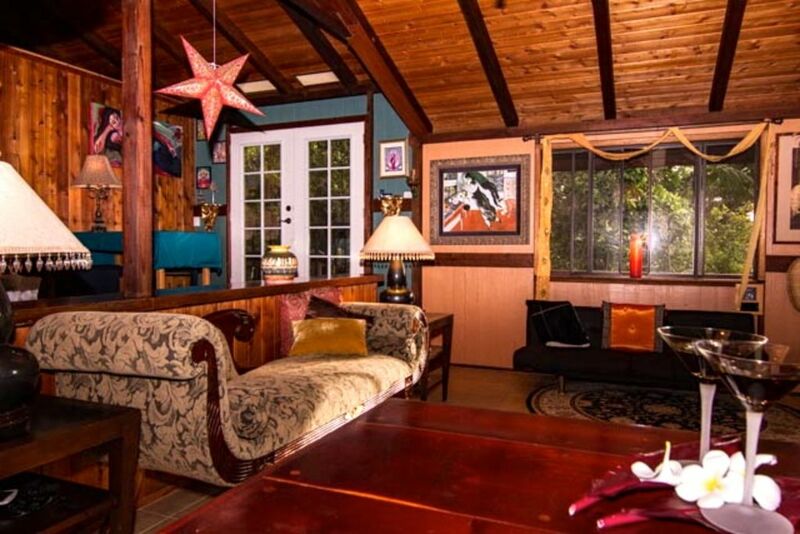 We enjoy the rural farm area of this location, but still only a 20 minute walk to downtown Hawi. Everyone we met in Hawi and Kapaau were friendly. If you are looking for a Hawaiian experience where you can get to know the local folks and escape the tourist "feel", then this place is for you. We enjoy the rustic feel of the home and it's coziness. This is definitely a neat spot near hawi and a cool project going on. We appreciated getting to have the experience, loved the outdoor shower and getting to pick some fruits from the land and eat them. It is for sure something we would have especially loved before having children, the place wasn’t exactly toddler friendly. It was not clear from the overview that this place was off grid. It said “powered by the sun” but that is different than off th grid. This would not have mattered so much except that the laundry scene was kind of shabby, and bc we have a toddler in cloth diapers that was a requirement of ours to stay somewhere so we could wash diapers. We still could but we had to start a generator that wasn’t exactly simple to get the washer going, and it need manual assistance to spin bc the spin slcycle wasn’t strong, also there wasn’t hot water and if uve used cloth diapers u know hot water is one of the only ways to get pee smell out! This is why only the 4 stars. We wish it had been more transparent bc we probably would not have stayed here this time had we known. In the end we felt like this place should have been a little less per night, but this area of the island is expensive. Also we’ve visited n kohola before but this time it was crazy windy, don’t know if it was the time of year, or that this zone is extra specially windy or what, but it was pretty intense. We really enjoyed staying at Andrea's place. We were surrounded by beautiful green vegetation and the sounds of nature. A great place to come home to after a day of adventure. The solar power worked just fine for us and we liked the idea of being off the grid. Thanks, Andrea. I missed the parking spot in front of the house and went round to the tree alley, either place seems fine, but I think its easier to get to the front door from the top side. I loved that this was Andrea's house, and still is part-time, because all her love and good energy is apparent. She has a book she wrote that is fun to read about her mid-life crisis and journey forward. The furniture is comfortable, the colors are wonderful - all sorts of wood. The outdoor shower was my favorite - don't miss using that. Delightful! We had a lot of clouds so used power kinda fast. Still, when we needed to charge we turned on the generator; I never felt power deprived. If you want TV bring your laptop and some movies. This is nicely off-grid. The sustainable farm next door - well I'm not a pig-farmer but the confines were a little disturbing to me (one large hog in a 2' wide space where it could not even turn around). But perhaps that is something that is done for a valid reason. The goats are all tied by their necks to posts - so for an animal lover it was not my favorite thing to see. Sightseeing! The Hawaii ruins past the little airport (drive into the airport) were well worth the visit - even with our 4WD the large pools of water had us walking the few miles to and fro. Go if you can. And sunset there was fantabulous. Hawi is nice little town to shop and eat. Polulu Valley 10 miles to the end of the road is a lovely looking place, it was too slick to walk down to the beach our day - but interesting that from there to Waipio Valley there are something like seven valleys between and a footpath that the Hawaiian royals and company used to walk. A retreat area for them. You can see the paths on the side of Waipio. Waikoloa is not far away and the beaches down that way are awesome. There is a lot to see and do so do your research and pick out what you have time for. It is indeed a BIG island so we stayed in three different points (10 days) and were able to really cover a lot of history and beauty in one trip. Away from it all yet a mile from sweet little town. We would stay here again in a flash...feels like you are in the middle of a jungle (which, I guess, you are). The very small town a mile away has nice gallerie, two very good restaurants, and a great ice cream shop. Two little grocery stores plus the Saturday farmers market can provide you with what you need, or there is a bigger grocery store that has everything 2 miles from Hawi. The house is unique and lovely and had just been "deep cleaned" (or perhaps Andrea keeps it this way for herself! ).